The stern and demanding daughter of a wealthy family is about to marry for the second time when her charming ex-husband arrives for the weekend--with a tabloid reporter and photographer in tow. In no time, she's drinking too much Champagne, flirting shamelessly with the reporter and re-evaluating her life. 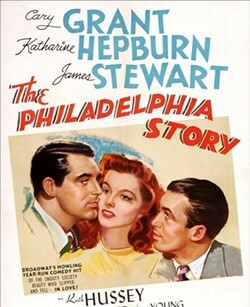 Starring Katharine Hepburn, Cary Grant and James Stewart. Directed by George Cukor. A brief introduction precedes the movie and discussion follows. Hosted by Charity Grella.